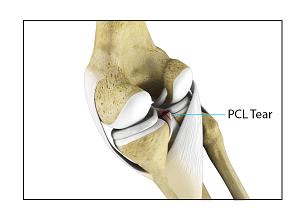 PCL injuries are very rare and are difficult to detect than other knee ligament injuries. Cartilage injuries, bone bruises, and ligament injuries of ten occur in combination with PCL injuries. Injuries to the PCL can be graded as I, II or III depending on the severity of injury. In grade I the ligament is mildly damaged and slightly stretched, but the knee joint is stable. In grade II there is partial tear of the ligament. In grade III there is complete tear of the ligament and the ligament is divided into two halves making the knee joint unstable. Diagnosis of a PCL tear is made based on your symptoms, medical history, and by performing a physical examination of the knee. Other diagnostic tests such as X-rays and MRI scan may be ordered. X-rays are useful to rule out avulsion fractures wherein the PCL tears of f a piece of bone along with it. An MRI scan is done to help view the images of sof t tissues better. Posterior cruciate ligament injuries most of ten occur in children who participate in high-speed sports, such as basketball and soccer. These injuries occur more commonly in teenagers than in younger children. of ten, in children younger than the age of 12, the bone where the PCL attaches breaks of f. As PCL injuries commonly occur through traffic and industrial accidents, the incidence of these injuries is very low in children. The outcome of the treatment is dependent on age factor. Younger children may develop arthritis symptoms later in their life if surgical treatment is not given. In adults' surgery involves PCL reconstruction, however in children this surgery is still under controversy because of a risk of developing physeal (growth plate) injury. Growth plate also called as the epiphyseal plate or physis is the area of growing tissue made up of cartilage (rubbery material) found at the ends of the long bones in children.